Today’s post will be long on pictures, short on words, because, well, I’m short on brain power. I know, what a surprise. I hope nobody has a heart attack, falls over and dies not not surprised. 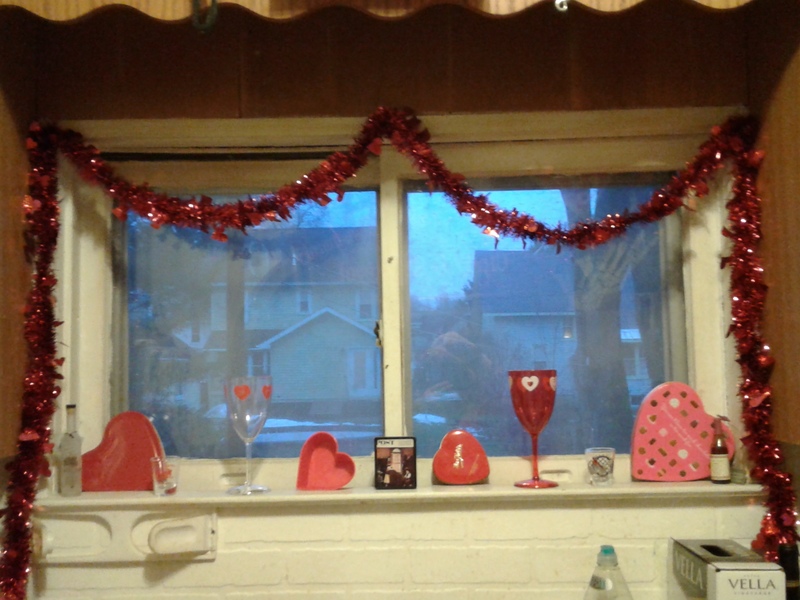 Be that as it may, I thought I would share photos of the lovely Valentine’s Day decorations my dear husband, Steven, put up. Ah, Valentine’s Day. For years it was a sad day for me. No card, no flowers, no candy, no love. Poor, pitiful me. Now I have a nice husband who decorates for the occasion. 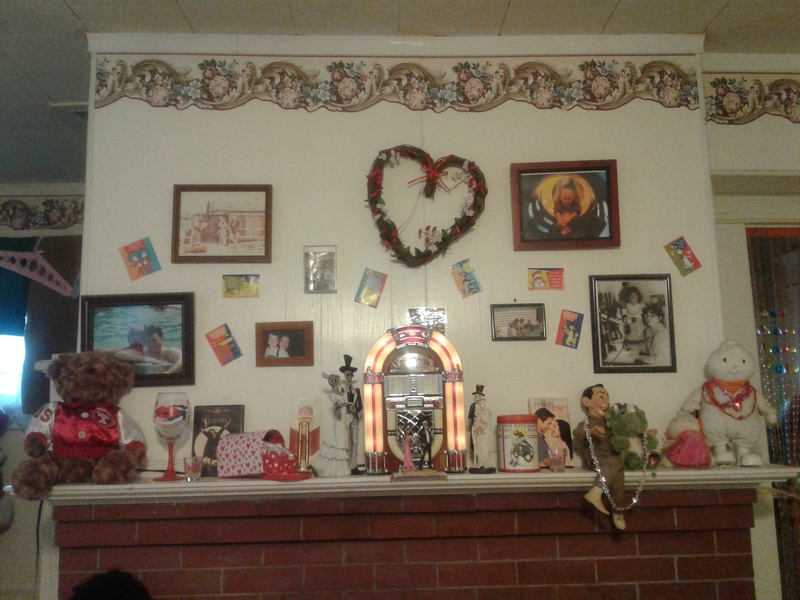 Here is our mantle. The photos are year round, as are a few other pieces. As regular readers know, Halloween lasts all year at my house. 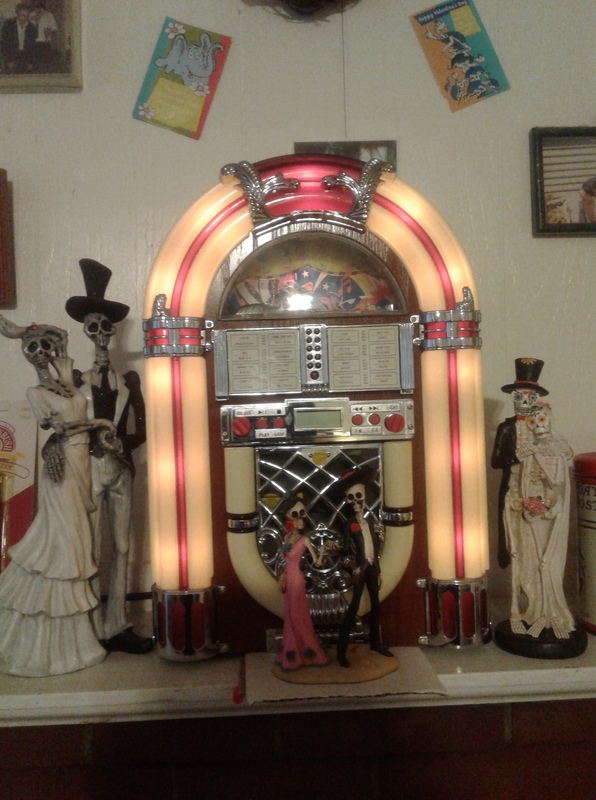 First I zoom into the center, on Stevens juke box and our dancing skeletons. That reminds me, I need to lose some weight. And take dancing lessons. Doesn’t everybody have a Valentine Dinosaur? 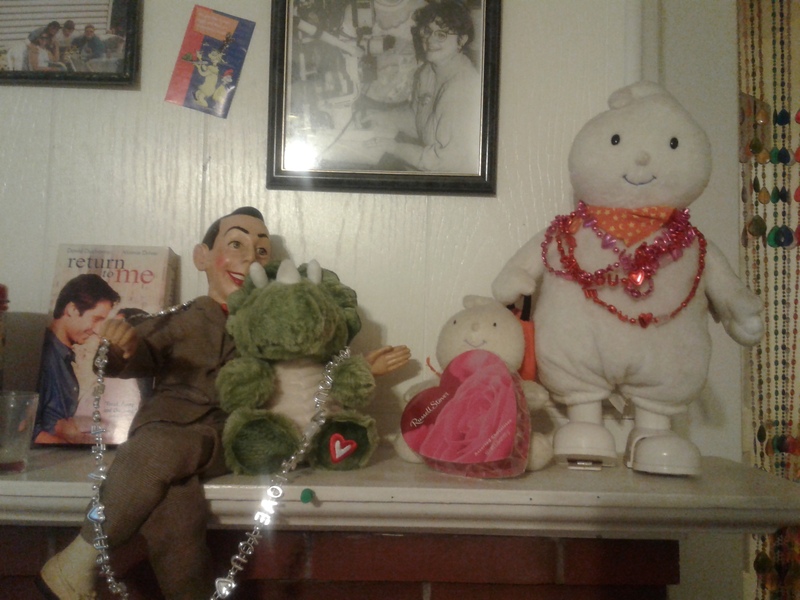 Peewee Herman is always on our mantle. I guess the lizard is his date. The ghosts are also year-round friends, with different seasonal accessories. They do make good snowmen at Christmas. The awesome wine glass was custom painted for me by a cast member of Leading Ladies, the play I directed at Ilion Little Theatre a couple of years ago. And isn’t this a sweet couple? The stool usually stands near our fireplace, unless we need it for human seating. 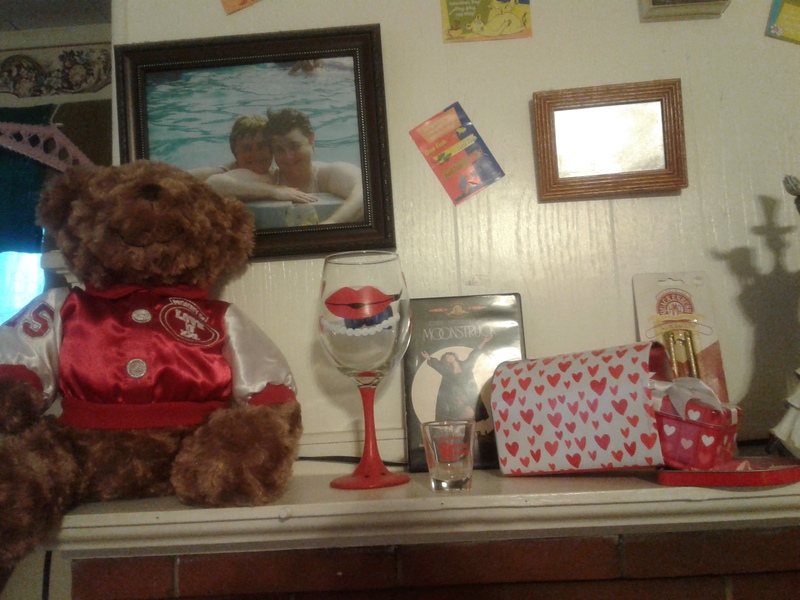 The gorilla is a Valentine decoration I purchased at half price at Winn Dixie in Georgia. 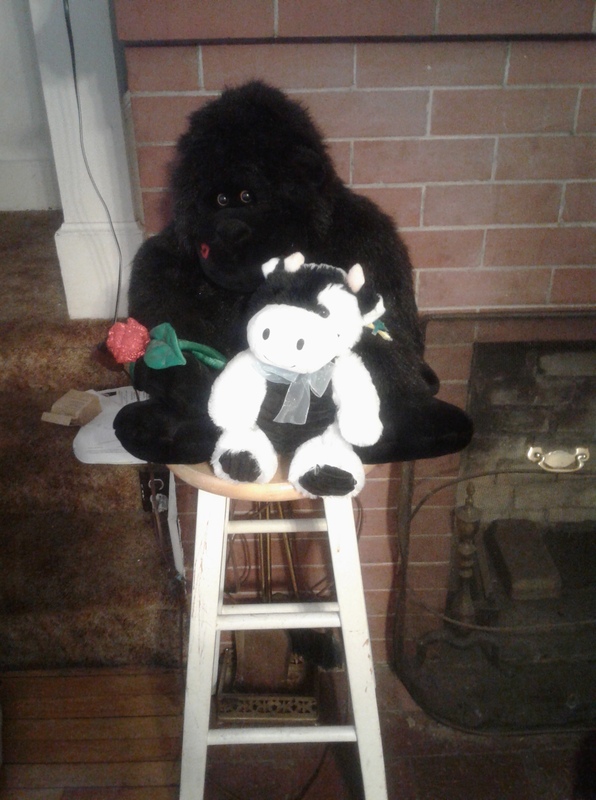 The occasion was Steven’s birthday, so we named him Bert the Birtday Gorilla. 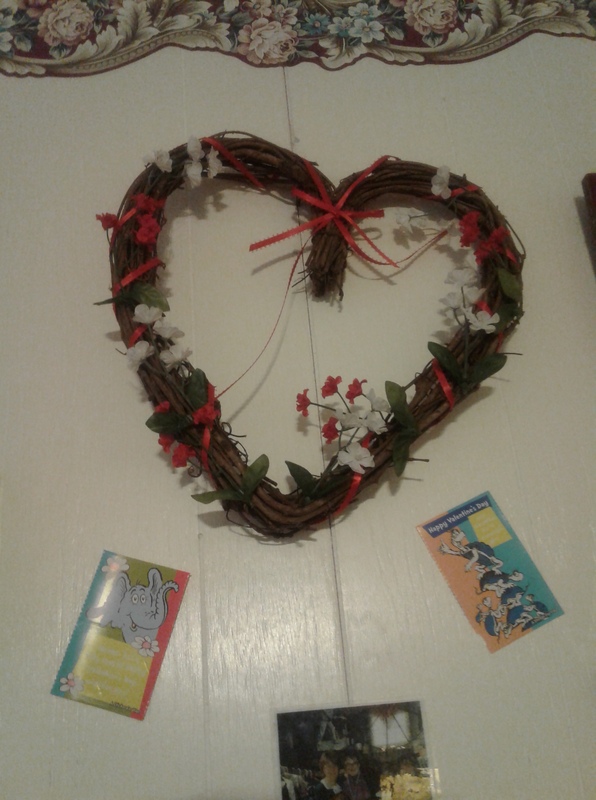 Dr. Seuss is good for every holiday! 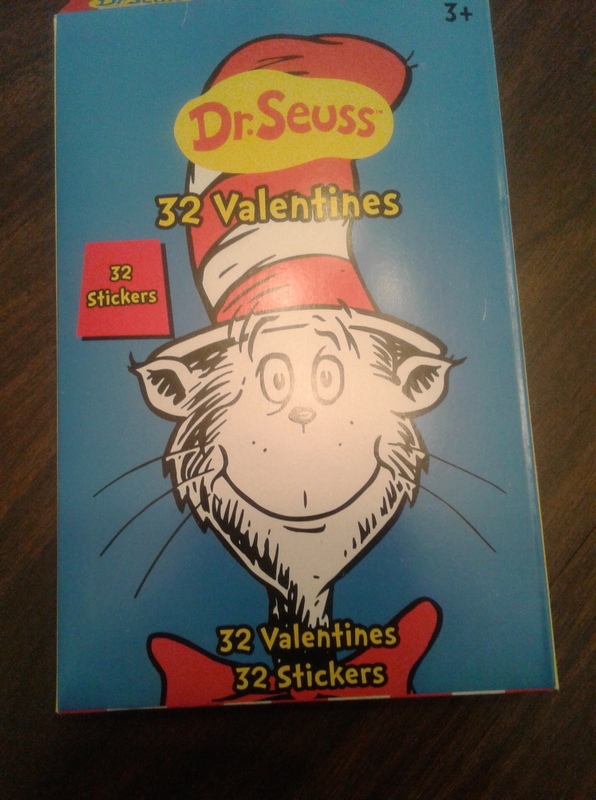 Steven bought a box of Valentines to add the the festivities. 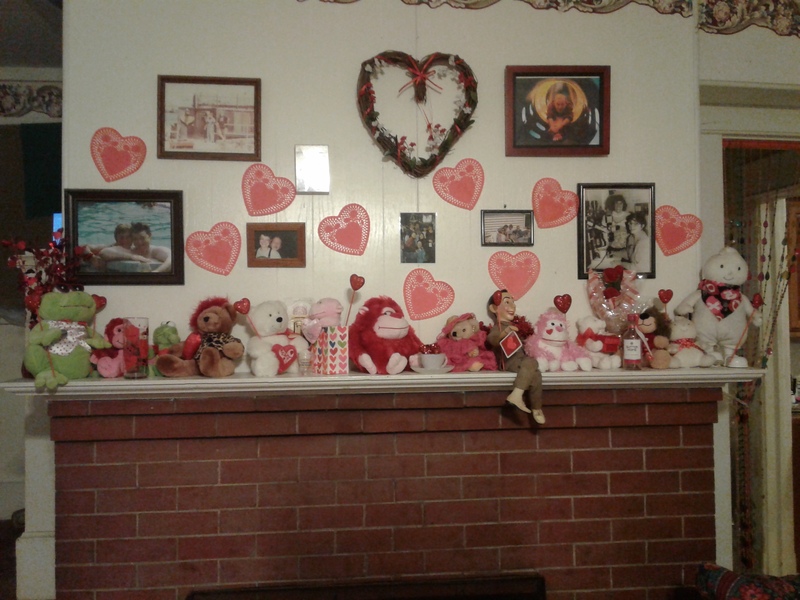 I don’t know if you can tell in the pictures that he put some on the wall. He said most of the Valentines available had superheroes. I’m glad he picked Dr. Seuss. In case I forget to say it next week, Happy Valentine’s Day, everybody. 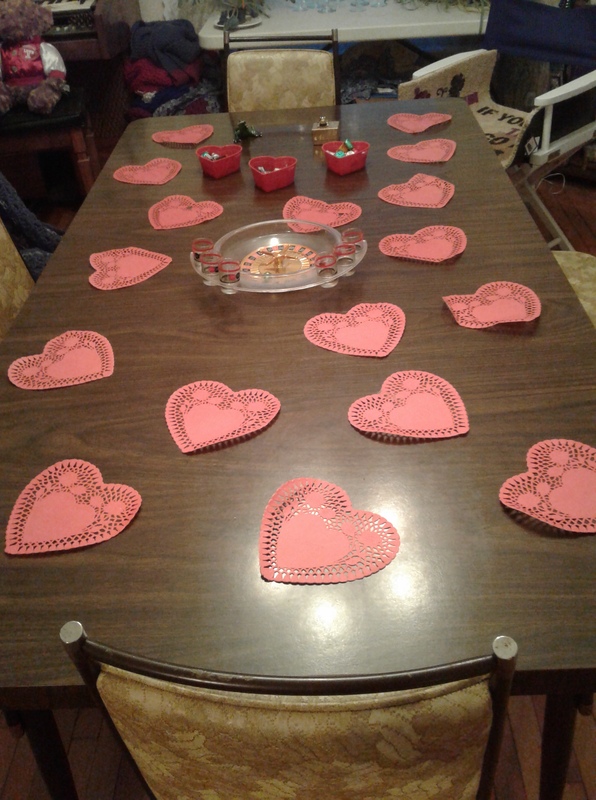 Posted in humor, personal and tagged decorations, home decorating, husband Steven, Valentines Day, Valentines Day decorations. Bookmark the permalink. On the post I made earlier today (which, I KNOW should have been published yesterday; I already apologized for that, stop giving me a hard time already!) (you know who you are), I forgot a few of our dear little scarecrows. I append a picture of them now, and will share their story, which I made up out of my head. Steve won the middle guy out of a claw machine. I don’t remember where we got the other two. 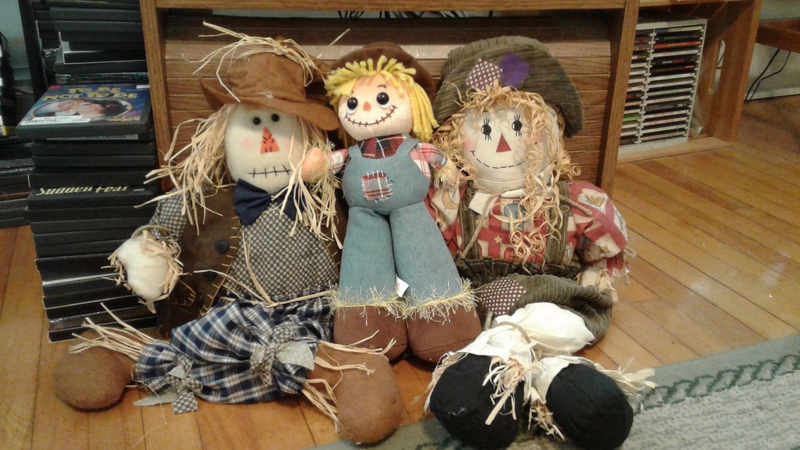 The two bigger scarecrows are boyfriend and girlfriend. The little one is the younger brother of the boy scarecrow. The girl scarecrow thinks the little brother is adorable and is always happy to see him. Her boyfriend is less pleased, because he wants to be alone so he can kiss her. I guess that is not a very long story. In fact, it is not a story at all but merely the situation. I suppose I could come up with a story about how the boyfriend sends his little brother away, and the little brother runs into trouble, and they all have a big adventure getting him out of it. I’m afraid I’m not much of one for short fiction, though. Don’t care to read it, not good at writing it. To each his own, as the old lady said when she kissed the cow. I guess that makes this not much of a blog post. On the other hand, this is Lame Post Friday of a holiday weekend. I’m going to call it good enough and see what kind of trouble I can get into. I hope you all had a lovely Thanksgiving. 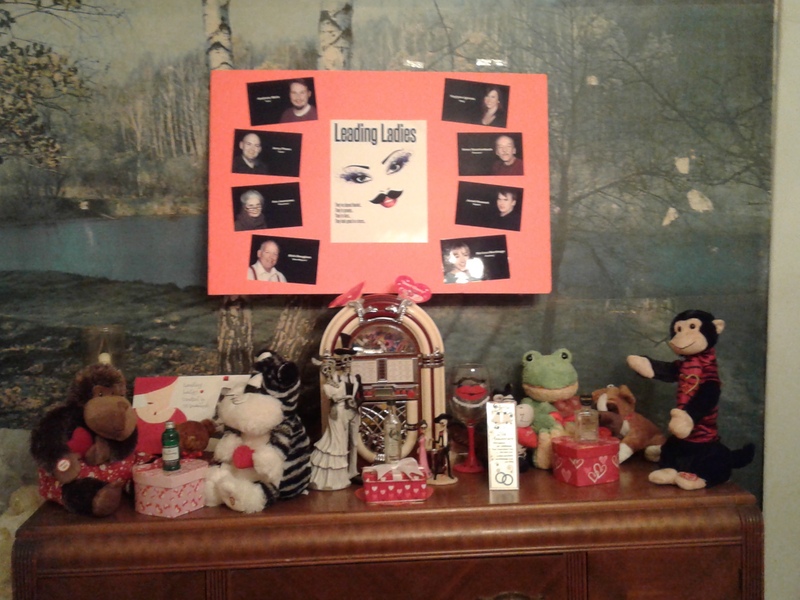 Posted in humor, Lame Post Friday, personal and tagged blog post, decorations, scarecrows, short fiction, story, writing. Bookmark the permalink.